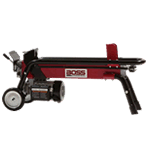 If you're looking for an safe, easy, clean way to split firewood, electric log splitters are what you need. As long as you'll be splitting near an electrical outlet, there's no reason to go gas. Electric log splitters can crack through some very large logs. There's no running out of gas, no oil changes to worry about, and they start and operate with the push of a button. Best of all, since there are no exhaust fumes, you can use them inside your garage, shed, or even in your home (if you don't mind a little mess). So stay warm and clean this winter with an electric log splitter, and split all the firewood you need with the push of a button. These entry-level electric log splitters are ideal for the weekend warrior, who wants to split wood without the hassle of routine maintenance. These inexpensive log splitters are truly plug and play. Simply plug it into an outlet and pull down the lever to start splitting seasoned logs up to 12 inches in diameter. 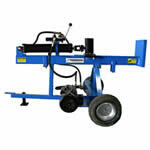 Consumer-grade electric models come equipped with small wheels to help maneuver around the shop. Plus, they're light enough to toss into the trunk and take to the lake house. Prosumer-grade electric log splitters aren't quite professional-grade, but definitely durable. These mid-level log splitters can generate 16-22 tons of force. Best of all, since there are no fumes, it can be used inside a barn or stable away from the cold. Prosumer-grade models are built on pivoting frames that can be towed around your yard with an ATV or tractor. While most can be connected to an ordinary extension cord, keep in mind that some require 220V power with a certain sized breaker. Ramsplitter 20-Ton Electric, for example, requires a 25 Amp breaker. Electric Log Splitter Buying Guide - Find Out How to Pick the Perfect Electric Wood Splitter. Our log splitter how-to library can help you pick the perfect electric log splitter, gas log splitter, 3-point hitch log splitter, skid steer log splitter or log splitter accessory.